Hello, everyone. Not only did I trick you, I tricked myself. I thought I wouldn’t have time to prepare this post before we went on our holiday but, as it turns out, the day before we left was wet and I was stuck in a small flat. Anyone who knows me would know that is cabin fever material, so I decided to prepare this post. I am a fan of frangipane tarts. I regularly make Damien Pignolet’s quince frangipane tart. I like them because they taste great and are robust – you can make them the day before you need them and they taste perfect the next day, and the day after, and the day after that. Better still, they freeze well. This recipe was no exception. I had never made a frangipane tart with pistachios but I was keen to give it a go and it lived up to expectations. There was only one problem. One of the ingredients is sweetened pistachio paste and Shane warned that it was an essential ingredient. I have no idea where you would buy this so I decided to make my own. I thought it would be easy but, let me tell you, it was not. I have a Vitamix which can handle most things you throw at it but it wasn’t having a bar of the pistachio paste. I followed this recipe. Luckily, I halved the recipe so I didn’t waste 250g of pistachios. The main problem was the oil from the nuts separated and there was no way I could amalgamate it. When my Vitamix over heated, I decided to stop. I had tried adding extra liquor and extra oil to make it softer so the Vitamix could cope but to no avail. In the end, I took out a small amount of the paste to be used in the pie and made little tartlets with the left over pastry and the rest of the paste. It tasted fab but was virtually solid. I then took 20g (which I needed for this recipe) and some of the separated oil and put it in my coffee grinder and whizzed away. It still didn’t fully amalgamate but the solid mixture was broken down into such small bits it was good enough for my purposes. When I put it into the sugar and butter mixture, I put the tiniest bits in each time so it had no chance of clumping. So, if you can buy the pistachio paste, I would. Shane suggested serving the pie with whipped cream, icing sugar and orange blossom water – so I did. Place the flour, butter, pistachios and sugar in a food processor and pulse until the mixture resembles fine breadcrumbs. Add the egg and egg yolk and pulse again until a dough forms. Turn out onto a lightly floured surface and knead lightly until smooth. If you can’t get a dough to form, add a wee bit of milk. Wrap in plastic wrap and put in the fridge for two to three hours. Roll out the pastry and line a 26cm loose-based tart tin with the pastry then place in the fridge for 30 minutes. Now this pastry is very short so it will be a miracle if you get it into your tin without the pastry breaking. Don’t despair. Moisten the edges and just patch it up. Once the filling is in, no one will notice. As mentioned above, I had too much pastry so I made mini tarts with the left over pastry and my weird pistachio paste. Preheat the oven to 170°C (fan-forced). Combine the dried apricots, sugar and water in a heavy-based saucepan over medium heat and stir gently until the sugar has dissolved. Bring to the boil, then reduce the heat and simmer for about 10 minutes. Remove from the heat and leave to cool completely in the pan. We sliced the apricots when they were cool but the recipe did not require this. Combine the flour and ground pistachios then set aside. Cream the butter, sugar, pistachio paste and salt together in an electric mixer until pale and fluffy. Add one of the eggs and beat until incorporated. Fold half of the flour mixture into the butter mixture. Add the remaining egg and beat in well, then fold in the remaining flour mixture. Spread a very thin layer of frangipane over the cooled pastry base. Spoon on the apricots, then top with the remaining frangipane, smoothing the surface. Refrigerate until the tart has firmed up. Bake the tart for about 40 minutes – until the tart is firm and golden brown. 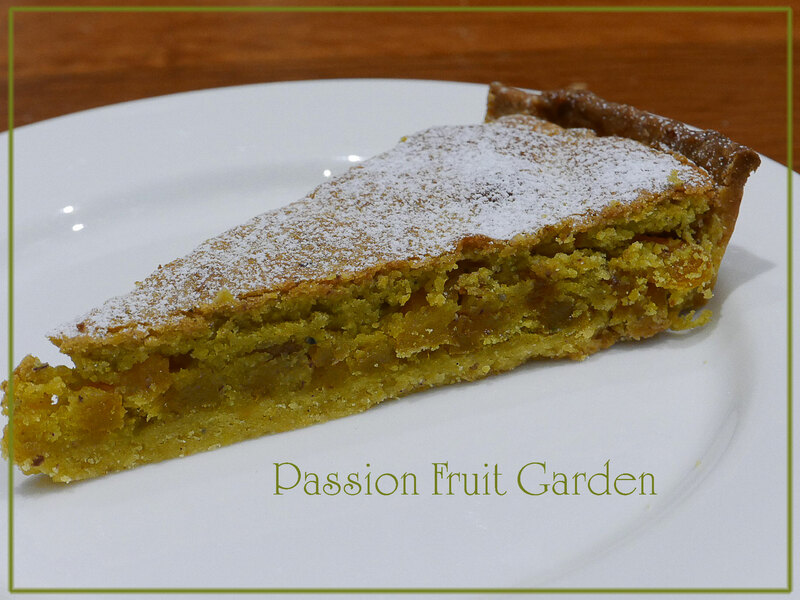 This entry was posted in Desserts, Pies and tarts and tagged Frangipane Tart, Pistachio frangipane tart by Glenda. Bookmark the permalink. i saw that essential ingredient has a product called pistachio nut butter. i wonder if that’s the same thing? Hi Sherry I don’t think so as this is sweetened. this is a link to a recipe i found. Hi Lily. Thanks for that, I will look out for it – mine tasted fine it was just too hard without its oil. Sounds heavenly although I don’t enjoy having to improvise with recipes on essential ingredients and having to try make my own like you did with the sweetened pistachio paste. Have a super week Glenda.